It seems like when Alice goes to Wonderland she always gets to meet some of the wackiest and most interesting characters ever conceived. Just look at the Mad Hatter, the Cheshire Cat, and of course, the dreaded Queen of Hearts. Of course, why would you want to meet the Queen of Hearts when you can be the Queen of Hearts? 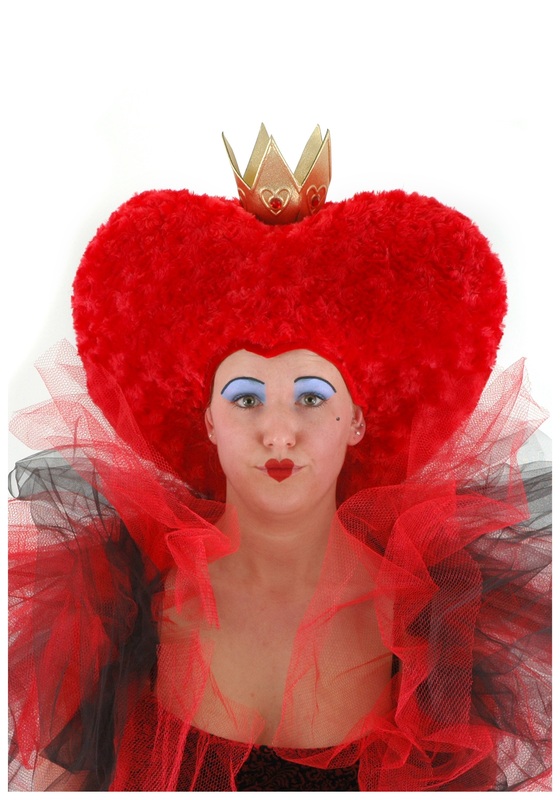 Well, with this Queen of Hearts Wig you can declare yourself the undisputed ruler of Wonderland and all its oddities! This officially licensed Queen of Hearts Wig is made of one hundred percent polyester with a polyurethane foam filling to keep it from losing its shape. This vibrant and colorful wig also comes with a small gold crown on top that features an assortment of heart accents and red jewels. Don’t forget to pick up a pair of our Queen of Hearts shoes and the Queen of Hearts Scepter for the full regal look that will have you yelling “Off with their heads” in style! This wig is wicked, I just stuff it with news paper and it was fine. Thank you for speedy delivery!